Whether you are buying a roof box carrier or have just bought one, there are a lot of things that you need to know about mounting, packing, and traveling with one of these on top of your car. Understanding everything that could go wrong and how to prevent it will help you maintain a hassle-free vacation. Knowing how to pack a roof box carrier means knowing where things should go and knowing how things should be oriented. This will change depending on what kinds of things you are bringing on your trip. However, there are a lot of general tips that will be helpful for anybody packing for a vacation. When dealing with a roof box carrier, you are dealing with space that’s often more limited than your trunk. To maximize your space, you will have to be a little strategic with how you load things. The following details some of the most important things to keep in mind when mounting, loading, and traveling with your roof box carrier. By remembering all of these tips, you can enjoy a hassle-free travel experience without having to worry about your belongings or the box carrier itself. A well-loaded box carrier will be easier to unpack in the future and safer to travel with but it all starts with the way that you mount your equipment. Making sure that your carrier box is properly mounted is the first step to a successful trip. 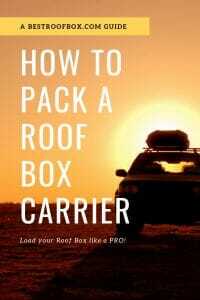 Once you have your carrier mounted, you can start learning how to pack a roof box carrier. Every rooftop box will be different so it’s important to follow all of these steps to ensure that you get yours mounted correctly before you leave for vacation. Read the instructions. Different box carriers will have different mounting requirements. There may also be some assembly required and a poorly assembled carrier may not mount properly so it’s important to read the instructions. You will also want to understand the proper way to mount the carrier and whether or not there are any indicators, latches, or locks that you need to be aware of. Pay attention to and understand the torque settings. Some carriers will have specific torque settings that you should look for and understanding these settings will make sure that you don’t over-torque or under-torque your rooftop carrier. A well-mounted, properly-torqued carrier will typically go without issue for your entire trip but doing it wrong could definitely result in damage to your vehicle. Some carriers such as the Thule Motion XT have torque indicators that tell you when your carrier is perfectly mounted. Consider lubrication. Chances are that your carrier will become exposed to the elements at some point during your travels. To prevent various fittings from corroding over time, you can find a grease to lube parts such as the mounting bolt threads. Doing so will protect them from water and corrosion and it will also make handling them in the future much easier. Get help when you need it. Mounting your carrier can prove to be more of a challenge that you think and many carriers weigh upwards of 40 pounds. The last thing that you want is for your carrier to fall to the ground or damage your vehicle somehow so it’s better to have somebody help you than to continue struggling on your own. Make sure that you have the right roof rack. Unless you buy a bag, you are most likely going to need a roof rack; obviously, make sure that you have one in the first place. If you do have one, you need to make sure that your carrier is compatible with the existing roof rack. Many of them will be able to fit factory racks but other times you will have to buy a rack specifically designed for that carrier. One of the biggest concerns when loading your box carrier is overloading it so the first thing that you want to do is determine what the weight limit is. Both your vehicle and your box carrier will have separate weight limits and while they will usually be high enough that there is no worry of exceeding them, you still want to know what they are. Your carrier’s weight limit should be in the instructions somewhere and if you take all of the following advice, you should have no problem loading your box carrier safely and efficiently. Pack the heaviest things in the car first. If you are planning on using your car and have a decent amount of trunk space, you should start with that. Once you load things in your car up to a reasonable height, usually just before the back windshield begins, you can start putting the rest up in your rooftop carrier. You start with the heaviest or boxiest items in the car because your trunk will have a higher weight limit than your rooftop. Put your suitcases in your overhead storage. Most rooftop storage boxes are designed in a way that makes them perfect for suitcase storage. You should have no problem laying suitcases and bags side by side in your rooftop box. It will often be loose enough to where they will all fit comfortably but tight enough to where they aren’t sliding all over the place. If you can fit your suitcases up top, you have all of the trunk space you need for the rest of your items. Put your sports equipment up top. If you are traveling for a sports-related reason or are simply taking your gear with you, these things are often better in an overhead storage box. Specifically, things such as skis or snowboards often fit nicely in a rooftop cargo box and some of them are specifically designed with this purpose in mind. Having long, awkward items in the box means that they aren’t getting in anybody’s way inside of the car. Distribute the weight evenly. Weight distribution is a key element of knowing how to pack a roof box carrier. If your storage box is heavily weighted down on one side, it could be a problem and it might also result in a lot of sliding around. If you do need to put heavy items up in your storage box, you want to distribute the weight as evenly as possible. It’s usually better if you can get heavy items to stay in the middle but if you can manage to secure half of the things on one side and half on the other, that could work out as well. Take advantage of any straps or holders. Many storage boxes will come with various straps or holders on the inside and you can use these to secure certain items. Doing so ensures that you can control movement as much as possible and that you minimize noise during your travels. If your storage box has ski holders, you can even use these as compartment dividers and separate your belongings while also keeping them more secure. Wrap things in plastic. Your box carrier should have no problem keeping your belongings dry in the rain as they are sealed and secured with locks. However, as an added precaution, you might want to consider wrapping certain things in plastic bags, especially if they are valuable. Some box carriers and storage bags may struggle in really heavy rain and while the chances are pretty low that your things will get wet, you can never be too careful. Keep the locking system clear. You will be relying on the locking system for your storage box to keep your belongings secured so you will want to be conscious of these components when you are loading. If you block them or obstruct the closing of the lid in some way, your storage box may wind up springing open as you are driving down the road. Some rooftop boxes will have more than one lock so just double-check and make sure that they are all locked properly before you leave. Tie down the box. As another act of precaution, you can tie down your rooftop box with straps or bungee cords simply to give yourself some peace of mind. The box itself should be reliably secured to your roof but if you want that added protection, don’t hesitate to throw some straps across it after you have gotten everything loaded. Get somebody to help you load. Rooftop cargo boxes can be difficult to load from a standing position on the ground so for the best results, it’s wise to get somebody to help you. One person can be on the ground handing you the luggage while you stand on the floor of the backseat. You could also use a ladder or some other tool to help you reach the top. This will give you greater control and allow you to spend more time organizing your storage box for the best load. Know your limits. Typical car roof racks have a weight limit between 75 and 250 pounds including the weight of the storage box itself, which could be around 50 pounds. Making sure that you don’t overload your roof is important so you don’t damage anything. As far as organization goes, it will depend on what items you have and how much space you have in your storage box. Strategic organization is the key to a successful load as well as a quiet and worry-free travel experience. However, when you know how to pack a roof box carrier, you can avoid potentially costly mistakes and ensure that your belongings are well protected for the entire trip. Here’s some more tips from Roof Box makers, Yakima. Once you have everything loaded in an effective way, you can safely head out on the road. However, there are also a number of things that you will want to keep in mind as you are traveling. Remembering all of the following tips will help you save on gas and avoid costly mistakes. Remember your new vehicle height. Remember that once you add a storage box to the top of your car, you may not be able to access all of the places that you could before. You might want to keep this in mind when you are entering parking garages, residential garages or carports, and even drive-thru restaurants. In most cases, you will probably be fine but if your storage box is particularly tall, you should be careful to avoid damaging your car or another object. Know the weather conditions. If you weren’t planning on wrapping items in plastic or strapping your cargo box, you may change your mind once you check the weather. If the weather on the way to your destination calls for heavy windows or rains, you can prepare for these conditions before you leave rather than get caught by surprise and potentially run into problems. Many cargo boxes, including Soft Roof Bags are 100% waterproof, which will certainly help in inclement weather conditions. Check for speed limits. Yes, you should obviously pay attention to the speed limits on the road but some cargo boxes actually have maximum speed warnings that you should be aware of. While most boxes are designed to be aerodynamic, the drag will still increase with your speed and if there is a limit mentioned in your instructions, you probably should heed it. Maintain proper tire pressure. Having a storage container on top of your vehicle is going to create some drag and may lower your fuel economy; while there isn’t a lot you can do to make this better, there are things you can do to prevent this from getting worse. Tires that are low on air are known to hurt gas mileage but by making sure that they are properly aired up, you don’t have to worry about slowing down your vehicle even further.